I’ve been taking a break from the Friday Favorites, but I just can’t help myself! There are so many good and wonderful things in the world, and I want to share them all with YOU! In the past I’ve done five things in a collection that I have been loving…five books, five podcasts, etc. I’ve decided to revamp the Friday Favorites, and I want to share with you a collection of anything that I am loving at the moment! This week, I wanted to share with you a few things that I have discovered or fallen in love with during our moving process, so check it out! Before we get started, let’s take a moment to give The Hubs a huge shout out on this GORGEOUSdining table he made out of reclaimed one hundred year old barn wood and black iron pipe! He made this table when we lived in Pennsylvania, and the beast has been moved TWICE! I adore this style of furniture, and The Hubs has also made a bookshelf, coffee table and wine bar in the same fashion! Yay! BUT…the FIRST FAVE of the week are these gorgeous chairs! These Poly and Bark Trattoria Side Chair with Elm Wood Seat in Bronze (Set of 4) are AMAZING! They are available from Amazon with PRIME shipping, and not only are they are super affordable, they are super easy to assemble! For the past three years we have been using vintage chairs that have worked great, but aesthetically, they didn’t go with the new table. I think the new chairs make the table complete! SECOND, Home Depot for the win! Our house has zero carpet, so we wanted to get an area rug for the living room and possibly one for the dining room. We went to Home Depot to buy a fairly inexpensive, yet nice area rug for the living room and found the beautiful rug pictured above for the most amazing price! I think we paid $35 for the dining room and $68 for the living room! While I can’t link the exact same rug, this is a comparable! I have never shopped at Home Depot, I’ve always been a Lowe’s girl, but honestly, they were super friendly and helpful, with great prices…they may get the majority of our future home improvement business! But this rug just ties the entire space together! Stay tuned for the finished room when it gets fresh paint! THIRD, this Marble Contact Paper that you can get shipped PRIME from AMAZON, and the options for this are endless! Obviously you can line your cabinets…but that’s NOT what I am loving it for! Obviously I love the contact paper for lining the shelves in the pantry! It makes the pantry look super cute! BUT…another thing I am loving it for is covering the light switches! The light switches are all old, painted and messy but a little leftover contact paper and they are good as new! 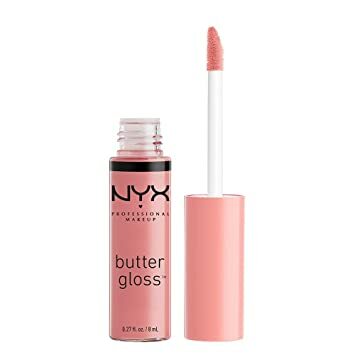 FOURTH,NYX PROFESSIONAL MAKEUP Butter Gloss in Creme Brulee ! It provides a kiss of color without the stickiness! I hope you enjoy the Friday Favorites! Share in the comments what YOU are loving this week!